The attainment of power, whether political, economic or otherwise, always appears to guarantee a global audience and make gradual cultural colonization seemingly effortless in its aftermath. History has numerous examples. Inspired by India's steadily booming and globally influential economy, acclaimed filmmaker Shekhar Kapur thinks that the time is ripe for what he terms a "reverse cultural colonization". Last September, he along with author Deepak Chopra and a Virgin Comics team of extremely talented artists based out of Bangalore joined hands with just this intent. This partnership led to the creation of a highly stylistic re-packaging of a 5000 year old Indian legend recast in a post-apocalyptic setting. A legend that has been the bedrock of India's cultural identity for centuries. Ramayan 3392 A.D. is what its called. A cursory glance at some of the pages and artwork that have been released on the internet, and I was pretty impressed. In my opinion, it might just be a timely, worthy and refreshing re-telling for a whole new generation, and I can't wait to get my hands on a copy. Especially since the earlier hugely popular "original" Doordarshan TV version had assaulted my senses so seriously, that I was displaying suicidal tendencies in an effort to remain very dooor from this epidemic Ram-darshan. "The re-imagination of Indian mythologies and archetypes with a cross cultural flavor will ignite once again our collective yearning for achieving the impossible and embarking on a journey of mystery, magic, and adventure. It may well usher in an age that Homer never dreamed of." Ambitious words, even for a spiritual guru. Lord Ram (or Rama as he is also interchangeably referred to) and his projected career path reminds me a lot of Thor, the Nordic God of Thunder. Mighty Thor's little stint at Marvel comics, did him a world of good. Comics, have in general proved themselves to be an effective cultural delivery mechanism. 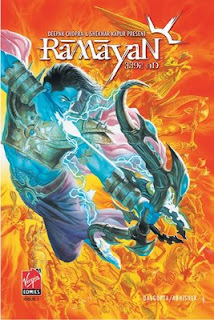 I am inclined to believe Shekhar Kapur, in that the time is indeed ripe, and in fact, Ramayan 3392 A.D. seems to be doing quite well in the occident (Even accounting for the multitude of NRI's that can corrupt and disfigure any statistics gathered on the global reach of Indian influences). What might give this an added lift locally, is if our friendly neighborhood cultural police find something offensive within all this comic-ry, protest and then quietly step back after boosting its publicity. Is someone going to burn an effigy of the creators soon, or do I have to start it off by complaining about the particularly immoral hue of blue that they used on Ram's skin? No, ...wait. I hear they've allowed for a minor conflict to develop between Ram and Lakshman in their storyline, damaging our hitherto uncorrupted tradition of sibling bonding. And since my grandmother told me that that wasn't so in the original version, I rest my case.